In 2007, $1.7 billion was spent on weight loss or diet pills, according to research from Nutrition Business Journal, appearing in Newsweek magazine. Some appetite suppressants are on the market as dietary supplements, which are not regulated by any governing body, and can be purchased over-the-counter. Other appetite suppressants must be prescribed by a medical provider. They require a prescription and are approved by the U.S. Food and Drug Administration, or FDA, but should be used with extreme caution and close monitoring by your doctor, says WIN, the Weight Control Information Network. According to PubMed Health, phentermine, whose brand names are Adipex-P and lonamin, is one of the two most commonly prescribed appetite suppressants. It is prescribed as a single daily dose—if taking the extended release--or before each meal, and should be taken with food. The recommendation is to use phentermine for three to six weeks, as it can be habit forming, states PubMed. Mild side effects include constipation, dry mouth, diarrhea, vomiting and altered taste, cites PubMed. However, it is the severe side effects that must be reported to your doctor immediately such as increased heart rate and blood pressure, shortness of breath, dizziness, swelling in your legs and ankles, tremors and chest pains, states PubMed. Phendimetrazine, whose brand names include Adipost, Bontrol, Obezine, Anorex, Plegine and Appcon, is taken two or three times per day before meals. 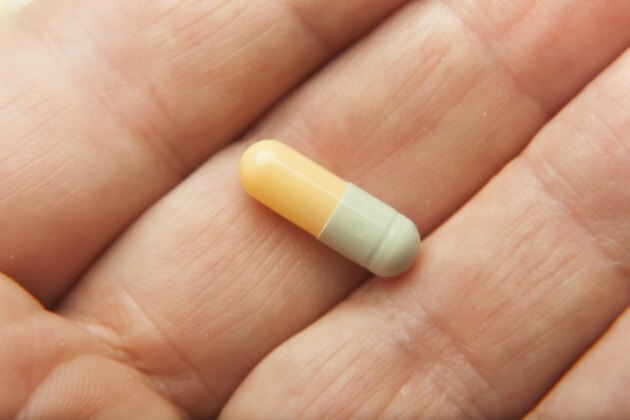 Like phentermine, it should only be taken for three to six weeks and discontinued when it is no longer having an appetite suppressant effect, according to the National Library of Medicine, or NLM. Phendimetrazine has properties similar to amphetimines, which are highly addictive, and can lead to dependence, insomnia, irritability, increased heart rate and psychosis, states the NLM. Diethylpropion, whose brand names are Tenuate and Tenuate Dospan, is taken once or three times a day with meals. It can be habit-forming and is only recommended for three to six weeks, like phentermine and phendimetrazine, according to PubMed. Its side effects include dry mouth, dizziness, depression, vomiting, and severe effects of chest pain, increased heart rate and blood pressure and swelling. With all diet pills, you should tell your doctor of any side effect immediately. Lorcaserin hydrocloride, sold under the brand name Belviq, controls your appetite by affecting the level of serotonin in your brain. Serotonin interacts with your brain cells, and this serotonin signalling regulates your appetite. By regulating your serotonin levels, Belviq affects your appetite. However, it also comes with serious health risks, including serotonin syndrome -- a serious health risk characterized by high levels of serotonin in the brain -- as well as less serious side effects, including dizziness and headaches.